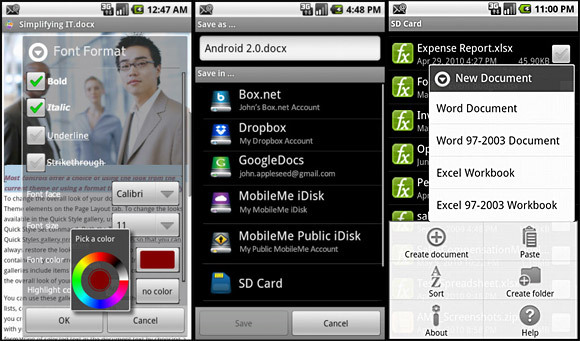 Quickoffice has released its Quickoffice Connect Mobile Suite for Android devices, offering full editing of Microsoft Office files as well as access to a variety of cloud-based services such as Apple MobileMe, Google Docs, Box.net and Dropbox. 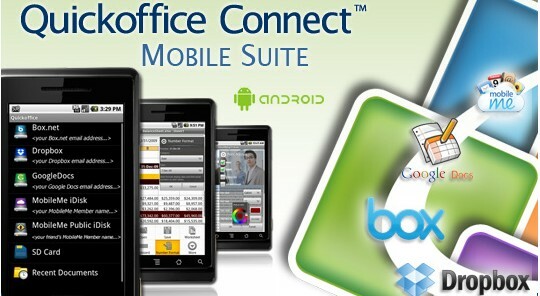 Running on the the Android Eclair 2.0/2.1 and Donut 1.6 operating systems, Quickoffice Connect Mobile Suite “seamlessly integrates access to remote cloud services within a full Office suite”. This means that users are able to view and edit Word, Excel and PowerPoint documents, including Office 97-2008 file formats, and view PDF files. Quickoffice can also open email attachments and side load files to the SD memory card, with a built in file manager providing handy folder navigation for easy selection and movement of documents. Thanls to deals done with Box.net and Dropbox, users can quickly pull up files stored in the cloud from within the Quickoffice application. “We’ve been shipping our viewing application on a variety of Android phones for the past year, and we’re extremely excited to launch our full-featured Quickoffice Connect Mobile Suite in the Android Market,” air-punched David Halpin, vice president of engineering at Quickoffice. Quickoffice already comes pre-loaded on some high end Android devices, with users able to buy an upgrade to include full editing and cloud access functionality from the Android Market for an introductory price of £10.40. Localized in French, German, Italian & Spanish!